My daughter (Gizmo) who is 4-years-old LOVES the Gremlins. She carries around a Gizmo doll everywhere she goes. 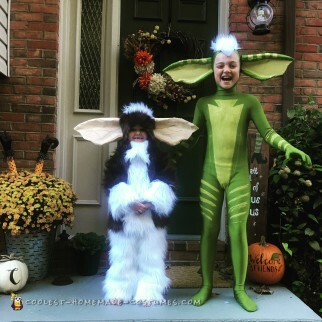 Her brother, who is 9, decided to make his sister a happy camper this year and while she dressed in a Gizmo costume, he dressed up in a Stripe costume. Gizmo is made from brown and white fur. I used a pattern used for the Wizard of Oz lion costume and modified it as a Gremlin. The fur was a MESS to sew, but I made it through. The Stripe costume is a green skin suit, and I hand painted the markings on it. Both sets of ears are paper mache made and formed with cardboard, newspaper, expand foam (that I carved to shape), and Modge Podge. Then I simply painted the ears to match each costume. I took a strip of leftover white fur from Gizmo and gave Stripe a mohawk. Stripe’s ears and mohawk are glued to a headband. Everyone absolutely loved these costumes! Let’s face it, everyone loves a good retro styled costume. They just do not make movies like they used to! And who doesn’t love a cute little Gizmo? Their memories are what matter to me the most! Thank you for giving me the opportunity to show off my little Gremlins that I worked so hard on. Don’t forget if you see these two out after midnight, do not feed them or get them wet! Especially the little fuzzy one!